Your bond data is biased. Unlike the S&P 500 which approximates the total stock market and avoids being invested in a single market segment, your bond data is invested in a single maturity (10 years) and a single sector (government). 1- It does not represent actual bond returns; it is a reconstitution from 10-year bond historical interest rates, without taking into account (unavailable) historical yield curves. 2- Treasury securities have tax advantages that can affect their pricing (no federal taxes). 3- For years where we can compare your chosen bond data with actual returns, after fees and tracking error, of Vanguard's Total Bond Market index fund (TBM), TBM had significantly higher returns. It is quite disturbing to see a comparison of relatively reliable historical total stock market returns with an unreliable single sector and maturity historical reconstitution of bond returns, in order to imply that 100% stocks will deliver better returns in the future. Have you read: http://www.efficientfrontier.com/ef/402/2cent.htm ? Basing investment decisions on past returns is foolish. @Anonymous: I'd be happy to repeat this exercise with different data if you can point me to some sufficiently long-term data. I have read Bernstein's remarks. It's amazing how much the numbers in his Gordon Equation in his second to last paragraph have changed in 12 years. I agree that using a short history of returns to inform investing is foolish, but I think the long term historical record is useful. Even if we had reliable data for two centuries, it would make for only 20 INDEPENDENT data points, and we don't even know what the distribution is (not normal). All I can say is: Good luck with your predictions! But, please warn your readers about the weaknesses of your data when stating your conclusions. And it's 10 independent data points for 20-year returns. @Anonymous: I checked the cumulative bond returns Siegel uses in his chart in Stocks for the Long Run. 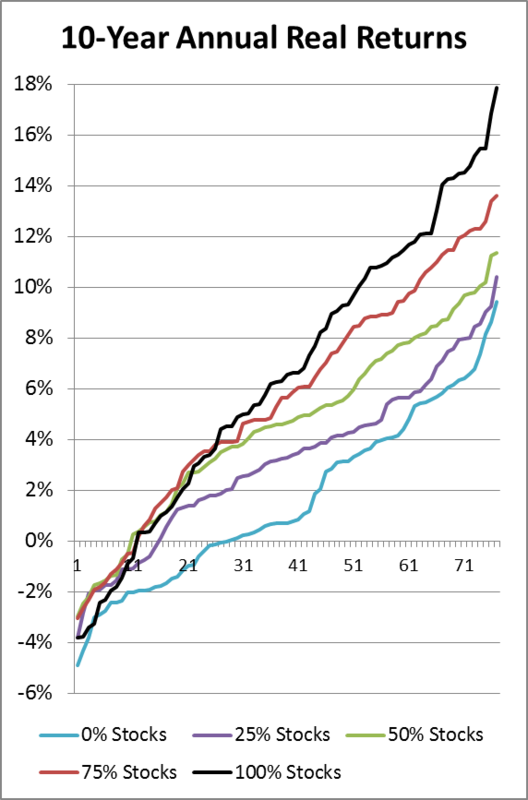 From 1928 to 2012 his returns are 0.37% higher per year than the bond returns from the NYU site. I don't know if this is due to different bond durations or any of the factors you mentioned. This would make a difference in the charts I produced but not enough to change the conclusions. I'd be happy to hear what you think is a better way to approach the question of stock/bond ownership. I've looked at it from many different angles and have yet to find any convincing argument for owning bonds for the long run other than limiting short-term volatility for investors who react emotionally. I don't find Bernstein's arguments convincing. The Gordon equation is a sensible way to look forward for a while, but not for 100 years. Already the Gordon equation gives significantly different answers today than it did in 2002. I think that you missed my point about having very few independent data points (even when including unreliable data). 1991-2010 is NOT independent from 1990-2009, it shares 19 out of 20 years of identical returns. 1970-1989 IS independent from 1990-2009 (not a single year of returns in common). We have very few such independent data points to make a proper statistical analysis. In order to come to any plausible conclusion on what returns we could expect, if the future was like the past, we would need a lot more independent data points, AND we would need to know the shape of their distribution. We have neither. You are drawing conclusions based on insufficient data. I do sincerely wish you good luck with your bet on stocks. @Anonymous: You can rest assured that I did not miss comment with the word independent in bold. Nor did I miss "biased", "disturbing", and "foolish". I'm well aware that we have a limited set of data. I'd love to have 100 centuries of solid data, but that doesn't exist. If we follow Bernstein in using the Gordon equation, stocks look much better than bonds today. How you think we should be looking at this question? @Michael: Sorry, if I offended you. I have no solution to offer you for predicting the future. Not knowing the future, a prudent investor would probably refrain from betting 100% of his holdings on a single type of investment. @Anonymous: Avoiding concentration is certainly a good principle. While limited to stocks, my own portfolio is spread across the whole world. I judge this to be sufficiently broad. Others may differ. On the subject of correlation among rolling samples, it's certainly true that they are not independent. However, when looking for what has happened to past investors who bought and held for 20 years, rolling periods provides somewhat more information than just using the few independent samples. Of course, my 67 rolling samples of 20-year returns contain much less information than 67 independent samples would, but I don't have that much data. One gets the illusion of getting more information, but the non-independent periods do not add information. Actually, that is the biggest problem: one exceptional year of stock returns inflates the returns of 20 different periods. When you have 67 periods, that means that you propagate this exceptional one-time return to 20 of 67 periods. This skews overall results in that direction. @Anonymous: Your reasoning explains why 67 rolling periods contain less information than 67 independent periods. However, you're not right in saying that non-independent periods add nothing. @Anonymous: It looks like I can only get 53 years of data on both Canadian stocks and bonds. I might try it anyway if I can figure out how to extract the data from the calculator easily. @Anonymous: The Libra data only goes back to 1970 for long Canadian bonds, and only back to 1980 for all Canadian bonds. So, extracting the data from the calculator appears to be the better plan. The Libra data could be used as a sanity check. Really interesting way to look at the data. I love this sort of thing. You ever read Mebane Faber's blog? He does a lot of similar "charting". As a 65/35 investor myself, yet only 32yrs of age, posts like these do force me to question whether I really need that 35% bond allocation. The only flaw I can see in your logic is that you cite "emotional weakness" as the only reason one might want the stability of bonds. I might also add that one ought to pay slight consideration to future "externally-caused uncertainties" that might be outside their control (where emotional weakness should be controllable). For example, illness, death, divorce, children, family issues, employment issues, etc. In other words I think, I hope, and my intent is that I won't need my investment money for 30yrs. However as I am not omnipotent, I have no idea what Year 17, or Year 24 might bring. With a 100% stock portfolio, one has to except the possibility that you could be down 30-50% at any given time, and there is risk if "things change" at that moment. @Anonymous: Thanks. I haven't seen Mebane Faber's blog. Perhaps I'll take a look. Don't be too hasty to make a change to your allocation. It pays to mull these things carefully. With the stock markets roaring for over 5 years now, it's getting easy to become comfortable with owning more stocks. If you increase your stock allocation now and decrease it again after the next stock crash, you're effectively buying high and selling low. You're right that events can force your hand on selling assets. You can buy insurance, have a solid emergency fund, and live on significantly less than you earn, but it's still true that a sufficiently bad event could still force you to sell at a bad time. Another reason that some of us don't invest solely in stocks is because we are not after the highest total return. I had almost no stocks for a long time because I could get a sufficiently acceptable return off fixed income alone. If those days return I will switch out of stocks again. If my core holdings increase enough that even at today's depressed rates I can get what I need I will also switch out. I frankly don't like stocks much and money isn't one of my prime motivators. It's like jobs. I could work for a much higher salary. I don't because the money doesn't matter that much to me. I also agree that investing only in 10-year treasuries doesn't particularly ring true. I've never heard of any fixed income investor who would do that. Your comparison is a bit like comparing a good blend of bonds with investing only in one blue-chip, no-growth, steady dividend stock, rather than in a market-wide index. Perhaps it would be better not to make any comparison if there is no good data available? It was interesting to read though and see the world through a different lens. You definitely provide a site with depth and detail and information to stretch the financial mind! @Bet Crooks: I'm not sure of exactly what you mean when you say that "money isn't one of my prime motivators." Taken literally, it seems to mean that you wouldn't mind if your money disappeared. But I'm pretty sure that's not what you mean. There are some people who have greater savings than they need and can fund their lifestyle with minimal risk by investing only in GICs. But I'm guessing that you are not in this boat. The only interpretation I'm left with is that you don't like short-term volatility, which makes you very similar to many other investors. I think I just killed my last reply. If not, apologies for submitting it twice! I am one of the weird few who wouldn't mind if my money disappeared. You'll more commonly find my type in convents, monasteries and working voluntarily in third world countries or rough situations in Canada. We're certainly not in the majority. And yes, we have enough now that we could fund our lifestyle with GICs. Our children, though, are still young and we've decided to try to grow our savings to help them get started in life. So we're investing in some equities to try to speed that up a bit. I don't like short-term volatility but it's never made me sell any assets. I invested a very small amount back in one of the first index funds (back when they were mutuals and it cost over $300 to make a single trade and was only possible through a broker). Back then, index funds were new and novel. I suspect I got the idea from the Wealthy Barber but I'm not sure. Anyway, it promptly lost a huge amount of its book value. But I didn't sell in fact I only got rid of it a couple of years ago. (I just didn't read the statements for about 15+ years. Scary eh?) Despite the various MER increases and rearrangements of the fund over the years, it averaged about 7% a year over that term so it wasn't a total loss. We're probably polar opposites: you'd prefer to invest 100% in stocks to maximize returns; I'd prefer to invest 100% in fixed income and am almost willing to accept the limited returns. @Bet Crooks: If you wouldn't mind if your money disappeared, why do you care at all how it is invested? Why do you care about volatility? If you or your spouse work, I assume you would continue to work for free if your employers stopped paying. How can you simultaneously care about giving money to your children but not care if you lost all your money? Your explanation gave me a little more insight into your thinking, but it still seems filled with contradictions. Hey. I never said I was easy to figure out! I care how our money is invested because I try to do a good job at whatever I'm working at. And since we do have money it should be doing something to stay ahead of inflation. What bothers me about stocks is that if I want to pull all of my money out in cash at a given moment I cannot control or predict what that amount will be at that moment. The fact that logically I shouldn't want or need that money for X years isn't enough to remove that feeling of unease because of the non-fixed value. I prefer the feeling the comes with knowing the exact worth of my savings at any given point in the very near future (e.g. during the term to maturity. Obviously I haven't any way of predicting future interest rates.) It's an emotional thing, not a logical thing. I do mostly work for free nowadays. My husband, by the way, does like money and would be upset if we lost all of it. He does some work for free and a lot of work that is well paid. I don't owe my children anything so if I lost all my money before any of it could go to our children it would be unfortunate but it wouldn't be the end of the world. It would be extremely difficult to lose all of my money if it was invested in fixed income assets within Canada, although it could be done. As my husband could warn you, Watch out for Geminis, they're often self-contradictory. Anyway, this is all way off topic about bonds vs stocks. I'll be curious to see if any other fixed income investors weigh in with another view. I wonder if David Trahair is reading any of this? @BetCrooks: I remember reading story about a surgeon whose skills were in high demand. He said "money is the most easily renewed resource." It seems that the fact that your husband is "well paid" could be influencing you in this way as well, but I don't trust my ability to make such determinations. Great blog and great topic. Regarding asset allocation, I have settled on an equal target weighting of Canadian, USA, and international equities, but I continue to struggle with the more important question of fixed income allocation (I have previously been lower over the last 20 years, but over recent years have been adding fixed income and was thinking of gradually moving up towards somewhere around 25%). I get your conclusions based on the historical data as presented. However what jumped out at me was: “… didn’t necessarily occur during the same time periods”, which I think means looking at those charts that the best case 20 year bond return of about 7% could have potentially occurred during the same period as the worst case equity return of just over 0%. To understand the probability of this, I think it would be useful to compare performance during identical time periods: ie the x axis showing the year where the time period begins or ends, and the y axis showing the difference between the 100% equity and 100% bond return. 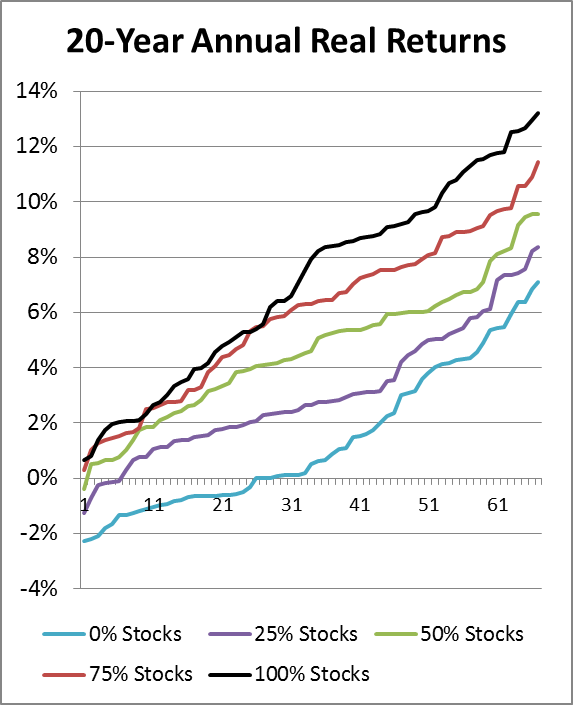 Depending upon what that shows, you could add all the mixed portfolios performance difference also versus a baseline of either 0% or 100% stocks. I’m thinking that would give an idea of how often, if ever, where fixed income outperforms equities over a longer period and thus if fixed income is a useful part of a balanced portfolio. Hopefully that makes sense; if preferable for you, I’m happy to take a crack at this if you send me the data. Many thanks for your thought provoking blog! @Anonymous: You can get all the returns and CPI data from the links in the article. I used the mixed portfolios to cover off unexpected correlations between stock and bond returns. For example, if they had strong negative correlation, you'd expect very good performance from the mixed portfolios. A reason to compare returns from the same time period is if you believe you can somehow discern from one year to the next what mix of stocks and bonds would be best. This is a form of market timing. I just don't think I can do this successfully. If I'm going to pick an asset allocation and keep it fixed for all the money I won't touch for 20 years, the analysis that I did makes sense rather than comparing data in like time periods. If you can figure out something new with your approach that proves me wrong, I'm interested. Glad you found my post thought-provoking. My point was not to suggest market timing, but rather that to settle on an appropriate long term asset allocation, you will be most concerned on how stocks behave versus fixed income over the same identical time periods (ideally the specific period of your holding), rather than relative performance comparing different 20 year intervals. I didn’t spend time to figure out correct compound return formulas, but I looked at that data, and did simple mean return averages over rolling 10 and 20 year periods, of 0% and 100% equity holdings, not factoring in CPI. Although overly simplistic numbers, the results / conclusions were not that dissimilar to yours: Over 10 year periods, the fixed income out performed in a not insignificant 10% of cases (the largest year of fixed income outperformance being a considerable 6% in 2008). But over 20 year periods, equities always outperformed fixed income. You've ignored taxes and included data from the prefiat money era. That makes bonds look better. I'd suggest reading Contrarian Investment Strategies by David Dreman. After reading that, I came to the conclusion tha any money I didn't need within 5 years should be in stocks. And a good case could be made for 3 years. @Anonymous: Most people will never use all their room in tax-sheltered accounts. But you're right that the analysis changes for those with significant non-registered assets. I took a quick look at the preview for Dreman's book. I'm not optimistic about a book that promises to help me beat the market. However, I would have read it anyway if my library had a copy. In any case, I'm already convinced that as I head into retirement, I'll use a threshold of 5 years to split my portfolio between stocks and safe assets. About stocks versus bonds, you only have to read p. 361-374. And your library may have an older edition, which gives the same message. About Dreman's goal to beat the market, he advocates using price ratios to value invest. That's not significantly different than the strategy used by small cap value ETFs. @Anonymous: My library seems to have nothing at all written by Dreman. I've read several justifications for choosing stocks over bonds. The most common themes are historical returns, "it's better to own than loan" and "it's better to own a slice of human ingenuity and work than to lend money to governments." If Dreman's argument doesn't fit into one of these categories, then I'm still interested. Dreman's conclusions are based on historical returns. What's different about his analysis is that he focuses on the fiat money era. In the gold standard era, deflation was common. Prices went down 30% in the Depression. Deflation makes fixed income more attractive. But with fiat money, deflation is much less of an issue. Analysis using data from the prefiat money era is less relevant to present investors, and will make bonds look like a better investment. He also takes into accounts taxes, which is not commonly done. I really enjoyed this post because currently my investment portfolio is all-stocks. It was interesting to see the different results. I started investing at the beginning of 2008 so I have only invested through nothing but good times. I guess only time well tell how I react to another stock market crash. @Mr. Captain Cash: To have an all-stock portfolio means you have to maintain a long-term view. Examine your needs carefully to see if any are shorter term. Taking a look at more realistic and Canadian portfolio returns data that Justin Bender has put together http://www.canadianportfoliomanagerblog.com/model-etf-portfolios/ provides another perspective. May be 20 years of data is too short, but it certainly makes the case for including some bonds in a portfolio. Any comments on this data? @Gail: Interest rates have been dropping steadily for 30 years now. This has made bonds look abnormally good. That said, Justin's portfolios look very reasonable to me. But he is in the business of creating portfolios that clients can handle. If he tries to force clients to take on more risk than they can handle, they will sell out at the worst possible times. I am primarily concerned with my own portfolio. I slept fine through 2000 and 2008, and I'll sleep fine through the next market crash. If Justin could get good return data for the past 60 years instead of only 20, the bonds in his model portfolios would look worse. But this doesn't mean he should remove bonds. He has to consider what's best for clients. Bonds reduce volatility. There will always be some years when bonds outperform stocks, but I never know in advance which years these will be. I expect that over the long term stocks will beat bonds. So, I put long-term savings in stocks and tune out the market noise. I try to be clear as often as possible that I don't recommend that others follow my lead. Living in fear and being unable to sleep at night is no way to live. For some reason, many smart people who need the safety of bonds can't admit to themselves that safety is the reason. They need to believe that somehow owning bonds will make them richer in the long run. This is unlikely. There is no shame in seeking safety. I stopped riding my bicycle because I don't like the risk of riding near cars. Others think I'm being ridiculous. In this area of life, I prefer safety. When it comes to money, I try to look ahead a decade or more and tune out the short-term. To each his or her own.